The Target Saver: Target:10% Off Target Gift Cards in Stores & Online 12/3 Only! 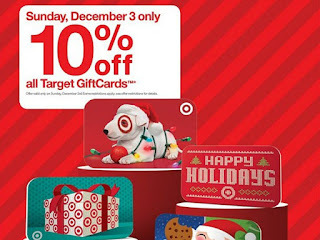 Target:10% Off Target Gift Cards in Stores & Online 12/3 Only! This Sunday at Target, save 10% on all Target gift cards! There is a minimum purchase of $10.00 and a maximum purchase of $300.00 in Target gift cards per household. You must make your gift card purchase in one transaction, either in-store or on Target.com. All gift cards purchased may not be used until 10:00 a.m. (CST) on Monday, 12/4. Here's the fine print: Limit of one transaction per guest and maximum discount of $30.00. This offer is not valid on Target Visa Gift Cards, Target MasterCard Gift Cards, American Express Gift Cards, Target trade-in Gift Cards or Target Gift Card reloads.